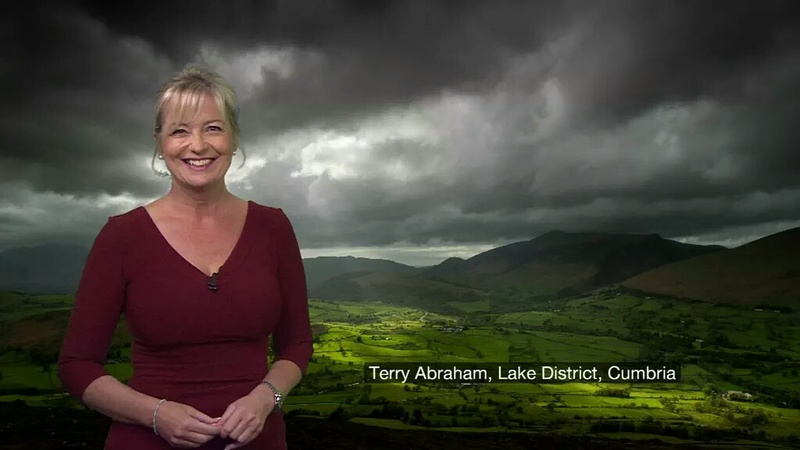 BBC Breakfast’s Carol Kirkwood in front of one of my photos from Threlkeld Knotts. It was some time in June when a lady from the BBC’s weather department tried contacting me with an interest in using some photos of mine she had seen on Twitter. 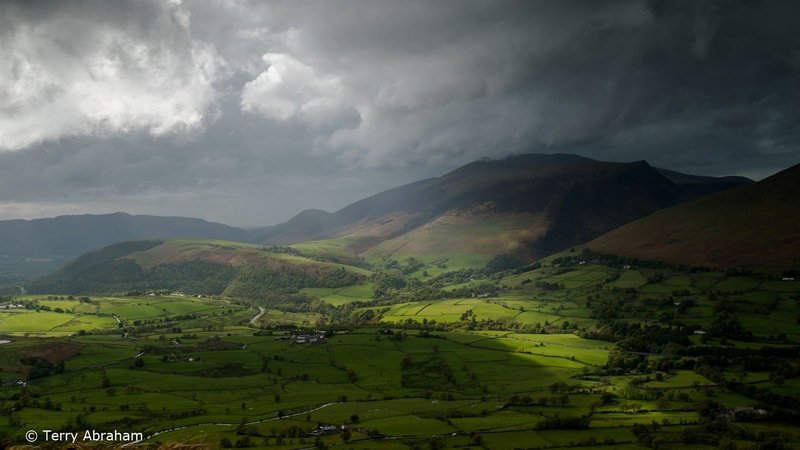 Scenes I captured from Threlkeld Knotts in the Lake District while filming ‘Life of a Mountain: Blencathra’. After we came to an agreement (once I managed to get to some decent WiFi with my laptop in Keswick) I sent a selection of photos over to the BBC to use as they wish. Since then the BBC have used them many times when reporting the weather on national TV! Lots of folks have got in touch with me asking about the photos so I thought I’d share here where, when and how I went about capturing them. In June I was based near Threlkeld for a couple of weeks and during that period the weather had been somewhat topsy turvy to say the least. Even so, it’s always worth a wander out and about – “better a rainy day out than a sunny day in!” I’ve already learnt that despite forecasts indicating poor weather for all of the Lake District National Park quite often the cloud can lift and break when the fronts begin to hit the Keswick and Blencathra area. Not always I have to add but definitely more often than elsewhere in the Lakes. Feeling restless one morning I decided to head out the door and take an easy uphill stroll to Threlkeld Knotts which is bypassed by most folks as they ascend or descend Clough Head heading to or away from The Dodds. This little visited outcrop at the end of the Helvellyn massif affords some fantastic views of the surrounding area. Much better than from Clough Head in my opinion. The unfurling view is much more intimate too. By the time I reached the cairn on Threlkeld Knotts a terrible storm was in full force. I could easily lean 45 degrees into the wind and not fall over. It wasn’t a safe day to be out on the highest tops make no doubt but thankfully after a little exploration I managed to find some sheltered spots in which I could get comfortably wrapped up and prepare my cameras for photography and video. Patience is a virtue so they say and never have truer words applied to my experience that day. If you asked me to sit on a bench in a city centre for several hours and do nothing else but watch the world go by, I’d politely tell you to go where the sun don’t shine! But when out on the fells I’ll happily do so without complaint. It’s a pleasure. And that’s what I did on a stormy Threlkeld Knotts. I sat and waited, constantly observing the views and changing weather hoping (and praying) something special would happen. 6 hours passed by when it became apparent to me that my time and efforts were wasted and so I began to pack my gear and head off back down the common dreaming of a warm fire and decent pint in the White Horse Inn at Scales. Just as I was positioning my cameras into my rucksack I noticed a subtle glow lighten up my hands. 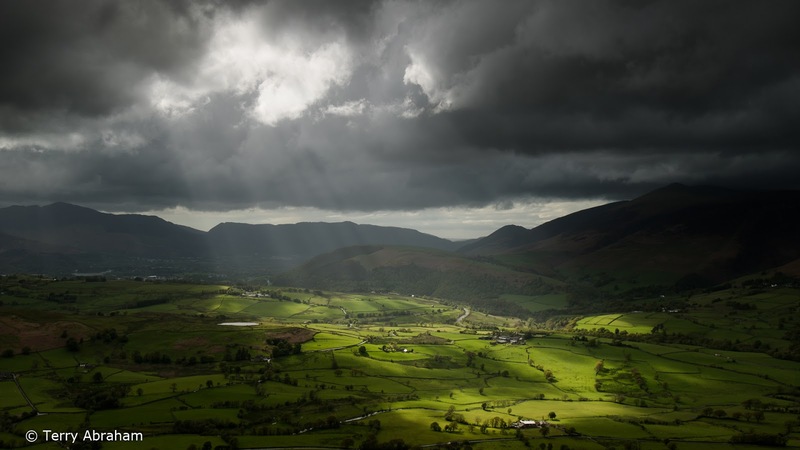 I quickly turned my head and lo and behold a break in the thick dark clouds was unveiling beams of sunlight onto the valleys and fells about the area. Needless to say, I ended up sticking around for a while longer snapping away furiously with my camera. And I don’t use the word furiously lightly either! I really had to battle the winds keeping my camera rock steady and firm to the ground while constantly endeavouring to prevent rain enveloping my lens! It was all worth it of course. I was absolutely buzzing when I descended the fell knowing my job was done for the day and the patience had paid off. Will I be using any of the video footage in my Blencathra documentary? I don’t really know. The winds bashing my camera didn’t help in keeping the shots steady despite my best efforts but the photos came out OK.
All the photos you see here, I used a pair of Lee filters in front of the lens to even out the exposure within the scenes. Other than that there’s not a lot else to say in that it’s all the real deal and I was very fortunate to be in the right place at the right time. There’s no digital trickery pokery when I’m filming and it’s exactly the same with my photography. It’s all ‘in-camera’ as they say. For the techy types amongst you I used a Sony A7S with a metabones EF adaptor coupled with a Canon 24-105mm f4 L series lens. I can’t recall right now the settings for each picture but it’s likely they were all set to f8 aperture and then I just adjusted the ISO and shutter speed accordingly. 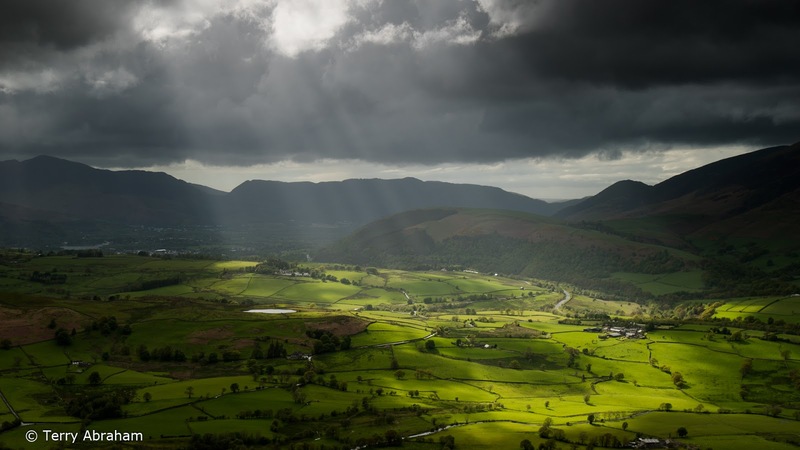 A break in the storm with light creeping onto Skiddaw from Threlkeld Knotts. The light becomes more intense out of the gloom of the storm. 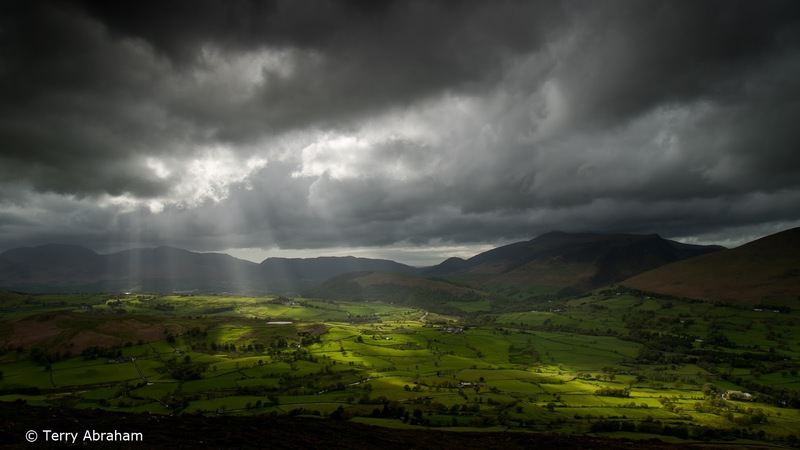 The heavenly light begins to move about the valley. 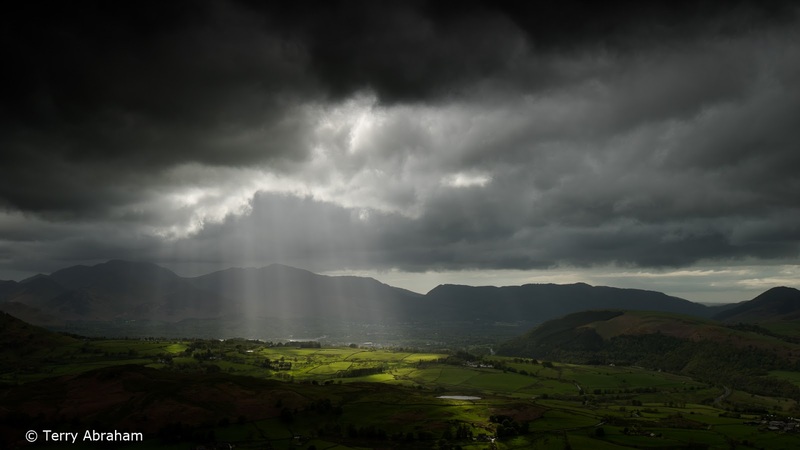 This was the initial view moments before the light really began to break through over Keswick way and towards Tewet Tarn. 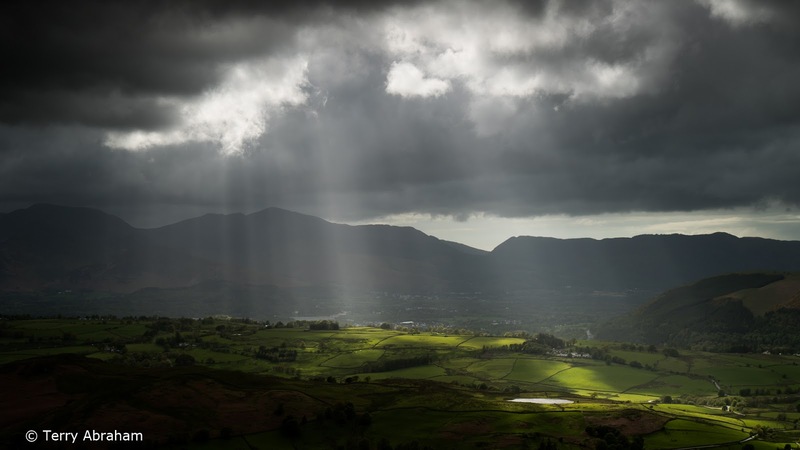 A close-up shot of the dancing rays about Tewet Tarn. A wide angle view of the scenes that were unfolding in front of me. I guess this blogpost goes some way into revealing that I don’t necessarily hike miles and miles up and over the fells of Lakeland. I much prefer to choose a location and sit and wait. You soak up the ambience more than you ever would when plodding along all day, occasionally pausing to admire the views. You get to enjoy in great detail the ever-changing ambience and various facets of such places. Places that are very dear to my heart as many of you will know. I often joke I’m sure I was born a shepherd in a previous life! But I’ll take that back now. I suspect I was born a herdwick sheep instead. Those stalwarts of the Lakeland fells who don’t rush around and are out and about their heaf exploring every nook and cranny.